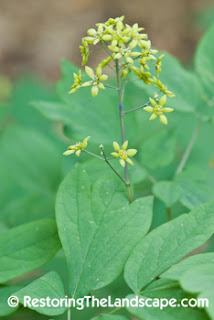 Blue Cohosh is a wonderful, delicate, spring flowering woodland native perennial. It is somewhat under appreciated because the flowers aren't particularly showy. It does have other note worthy attributes that make it an excellent addition to any shady, mesic site. 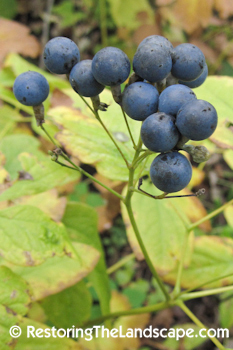 Blue Cohosh usually occurs in small groupings in the shade of deciduous trees on upland sites. 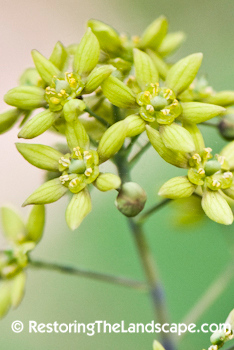 The small terminal clusters of 6 parted, yellow-green flowers emerge in mid May and arise above the blue green foliage. The flower and leaf stalks have a light blue to purple coloration which is quite unique. 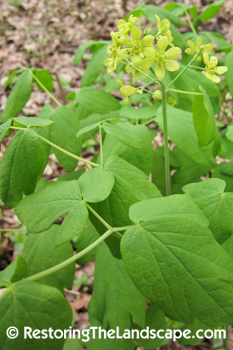 The leaves are large and three parted, which are again divided into 3 lobes. As the species name suggests (thalictroides), the foliage is similar in appearance to Meadow Rue (Thalictrum). Blue Cohosh is quite tall for early flowering ephemerals, reaching heights of 3 feet in moister sites. It stands upright and remains sturdy throughout the summer months. For this reason, it works well massed in a woodland garden and the texture of the foliage contrasts nicely with ferns and later flowering woodland species. The stalked blueberry like fruit develop by late August and mature from a light green to dark blue purple. They look like a fleshy berry but in fact its a hard seed coat covered by a blue skin. I have had some success propagating Blue Cohosh, the hard seed coat definitely needs to be scarified before planting. Young seedlings take a while to establish. Blue Cohosh is native to eastern North America, see map below for range.